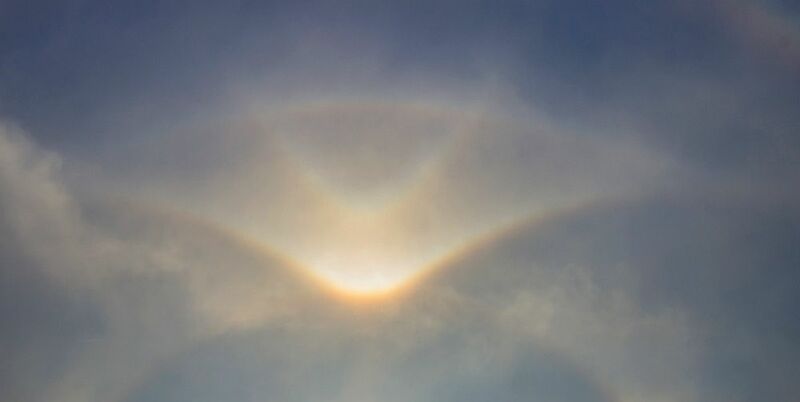 At the Fichtelgebirge, a low mountain range in northeastern Bavaria, there were similar halo phenomena as in the ore mountains circa 100km away (see article). In the morning, the high fog staunched and dissolved while passing the mountains. From afar, a very interesting cloud edge was seen at Mount Schneeberg (1051m above sea level). Shortly ahead Schneeberg, the temperature fell below -8 °C and rose to -5 °C in the fog. In the valley between the two mountains diamond dust was non-existent. I kept searching and trying to get out of the fog. Just in the village Grassemann (about 700m above sea level) there was a right parhelion and shortly afterwards a Supralateral arc visible above the fog. After 20 minutes, the fog suddenly came up to me and conjured a variety of halos in the sky. When I saw the concave and the convex Parry arc as well as the Moilanen arc distinctly, I was speechless. After that, the halo activity waned slowly. At 10 o’clock there were no more halos seen. The high fog broadened increasingly and the sun couldn’t shine through. Afterwards I drove to the top of Mount Ochsenkopf (1024m above sea level). There was a second halo show starting at 11.10 CET. However, expect of the right infralateral arc with the Tape arc, there were no further halo types.